Dexter , the series and the character, were based on a real person, Manuel Pardo, an ex-Miami police officer. who was executed in Florida last week. Pardo shared a lot of similarities with Dexter. Both were cops for the Miami police department, and both killed “bad guys” –though Dexter killed killers, while Pardo killed drug dealers. Both kept pictures of their victims, Dexter in his computer and Pardo kept polaroids. Both were exceptional family men and fathers. But why make the character American with an American name? Would audiences not relate to a Hispanic name? They should, it’s about time. Hispanics are an ever-growing share of the population –they practically chose the current president– so the producers could have done America a favor by introducing a major character in a TV show who would look like many of the people in their audience, or someone they know. The story could have delved on the war on drugs, on the weight of power over conscience, on racial relations in South Florida. In short it could’ve explored the war on drugs, offering insight into something that is tremendously important for US domestic and foreign policy, a topic most Americans don’t know much about. So think a mix of Breaking Bad, Dexter and Cocaine Cowboys that could provide a service to its audience. The fact that the producers anglified the main character is boring, predictable and lamentable. It makes a similar mistake as does The Impossible, the movie about the 2004 South Asian tsunami that anglifies and appropriates the stories and tragedies of hundreds of thousands of Asians. Not only that, but how pressing is it, really, to “understand” serial killers? Aside from our gory fascination with them, what are the odds you’ll run into one in your lifetime? What are the odds that any of the often fantastical material presented in Dexter as somewhat realistic drama will be relevant to your life? Whereas, drugs and the War on them are very relevant –to some people more than others, but definitely higher up the list of priorities than “serial killers” to most of us. Drugs, the mass incarceration of African Americans and Latinos, the international drug trade, are all issues worthy of discussion in the US and its neighboring countries. It’s a wasted opportunity to make entertainment that is valuable and that rises above the triteness of entertainment for entertainment’s sake. Similar to the wasted opportunity of having shows about Arab Americans that are true to life, or teaching Arab in schools. It’s the wasted opportunity of having the entertainment-news-media industry cover the Middle East in a more nuanced way so that once we hear about an Arab Spring we’re not left with no idea of what’s going on, or when Islamist extremists attack the US we are not left wondering why “they hate us for our freedom.” A similar service could be provided in regards to those Americans white America doesn’t know much or care about. Campbell’s photo appears to be on line as an EMT takes her pulse. Looks like she must have died instantly. I wonder if someone will take the photo down. Thanks. We already took the photo down on the site. Our hearts go out to the victims’ families. 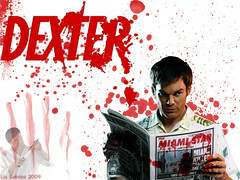 Dexter would not be as great a show if he was latino best show on tv as is! 1. Dexter does not collect photos of his kills, he collects blood slides. 2. Dexter is based on a book.